By Joe Buchanan, Swimming World College Intern. Day 3 of the Lewisville Futures Championship saw many familiar faces over the past two days return to the podium. Teams like the Chicago Wolfpack Aquatics Club continue to dominate the top spots, but fans also saw many teams new swimmers take home medals for their respective teams. The women’s 200 butterfly began the night with Ellie Flanagan of the Columbia Swim Club receiving her first medal of the championships with her time of 2:17.84. The Dallas Mustangs’ Rebecca Brandt placed second with a time of 2:18.89. In third was Alvena Walpole of the Alamo Area Aquatic Association with a time of 2:20.69. Andrew Limpert of the Mansfield Aquatic Club took home gold in the men’s 200 butterfly with a time of 2:03.07. He was followed by number 22 seed Luke Davis of the American Energy Swim Club who placed with a time of 2:04.60, a major lead over third place, Spencer Woodward of Lakeside Aquatic Club, who finished in 2:07.80. The women’s 50 freestyle had a long scratch sheet consisting of 79 swimmers. Of these swimmers, Kennedy Quist of the Aspen Swim Club took home gold with her time of 26.63. In second was Abby Kapeller of the Aquajets Swim Team with a time of 26.82, barely beating out Lincoln Select Swimming’s Alana Palmer who finished in 26.87. Chicago Wolfpack Aquatic Club’s Reilly Shields took home his first individuals gold of the Lewisville Futures with his time of 26.87 in the men’s 50 freestyle. John Shelstad of the Aquajets took second with his time of 23.83. Returning to the podium, Dalton Lowe of the Spring Swim Team finished in 24.09. Familiar faces took the podium of the women’s 200 breaststroke. Great Wolf Swim Team’s Reese Dehen earned her first gold of the championships with a time of 2:38.30. In second was the Aquajets’ Jordyn Wentzel placing for the second time this championship with a time of 2:40.45. In third, Molly Winer of the Ames Cyclone Aquatics Club, who finished in 2:41.33. The men’s 200 breaststroke was won by Greater Omaha Aquatics’ Conner Funke with his time of 2:20.66. Behind him was Forrest Frazier of the Iowa Flyers Swim Club with a time of 2:22.31. Coming in third, the first unattached swimmer to place in this championship, was Adam Fust-Molnar with a time of 2:23.80. The women’s 50 freestyle bolsters the most swimmers of any event in the 2017 Lewisville Futures with 90 competitors. Of these swimmer, Kapeller was able to return to the podium, this time with a gold for her time of 1:03.57. Brooke West of Team Millennium took second with her time of 1:04.55. In third Emily Smith of the Dunlap Dolphins Swim Team finished with a time of 1:04.67. These are the first two medals in the Lewisville Futures for both Team Millennium and the Dunlap Dolphins. Brett Spires of the Bloomington Normal Swim Club took first in the men’s 100 backstroke for his time of 58.21. Following closely, Alex Wowk of the Waunakee Wave took second with a time of 58.80. Brandon Garcia won another medal for the Alamo Area Aquatic Association by placing third with a time of 59.13. Carson Kaufmann of the Cypress Fairbanks Swim Club bested SwimTulsa’s Liberty Howell for the first time this championship with her time of 4:20.91 in the women’s 400 freestyle. Howell came in second with a time of 4:24.41. In third, Katia Soudakova of the Rochester Swim Club Orcas, finished with a time of 4:25.49. 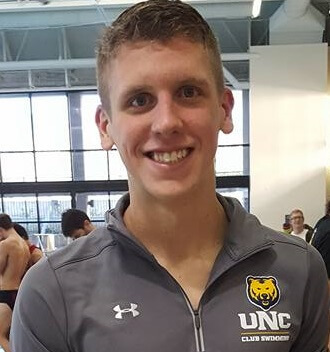 To finish the night, Chicago Wolfpack’s Jacob Furlong took home his third gold in the men’s 400 meter free with his time of 3:57.00. In second was Jack Little of the Jets Aquatic Club with a time of 4:02.86. In third, placing for the first time, was Trever Brenner of the Sioux Falls Swim Team with his time of 4:04.54.